Good point Brian :-) Yeah, those 2 images make it into the "same frozen faces pasted into slightly differing bodies and backgrounds" category. Yep, from now on, THIS is going to be my "one image test." If the human I am speaking with, after being shown that evidence, does NOT admit that the giants depicted there are obviously CGI, then I will simply stop speaking with such a self-deceiving reality-denying hopelessly-broken human. Simple and easy. Matt is interviewed a couple of days ago on the above show. No mention of the dastardly buggers who question the existence of Geoff. Although if I was the interviewer I would like to have asked Matt a few curly ones about receiving the VCF, and what constraints it places on him in terms of what he can and cannot mention in court. Anyhow Matt's big day is at Hastings Magistrates Court 23rd March 2.15pm. This weekend Matt's also appearing in a 9/11 play with David Shayler called 7 seconds. Ahh Marianne... 'its' cartoon foot was the spark that got me to join this forum. Such fond memories... now that they're all gone I'm actually really starting to miss them. Still as long as we remember them, each & every last angelic one of them, then they will always remain true in our hearts. We should never forget their infectious warmth & genuine spirit... blah de blah blah. Can a mod update the link in my introduction post with this? regarding the image brianv posted. That circle behind her head in the image on the left...is that supposed to be a hoop earring or what exactly? 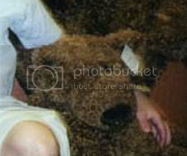 "It" appears that "sheena" (short dark hair) was overlaid on a previous occupant "dolly" (blonde curly hair). A dogs-dinner if ever I saw one. Critical Mass wrote: Now it appears that the entire living memorial has been removed. Anybody else confirming this or is it just a glitch with my computer? THE ENTIRE OFFICIAL DATABASE OF "3000 VICTIMS" ERASED FROM THE HISTORY BOOKS? Let us cautiously wait for a while and see if this isn't just due to some ongoing website renovation / re-styling on the part of Voices of September 11 (the OFFICIAL SITE OF THE NATIONAL 9/11 MEMORIAL AND MUSEUM). BOTH OF THE 'TOP' 9/11 MEMORIALS (VOICES OF SEPTEMBER 11 and CANTOR FAMILIES) NOW BACK ONLINE ! Whatever the reason for BOTH of the main 9/11 "victim tribute" databases to disappear (for a few weeks in March 2015) and reappear simultaneously, it is a rather interesting occurence. It would certainly suggest that the two, (seemingly unrelated) websites, are handled by the same follks, does it not? Edit : Omg - Critical Mass is right ! (see his post below). I hadn't bothered checking the Voices site yesterday! Am working at fixing our links now ! More later ! They may be both 'back up' but the majority of the imagery is still no longer accessible. James Maounis, Marianne Simone, Brooke Jackman, Christopher E. Allingham, Felicia Hamilton & Alexander Robbins Steinman are again fully accessible. Howard Kestenbaum, Gilbert Franco Granados, Daniel James Shea, Kenneth A. Simon, Patrick McGuire, David J. Grimner, Michelle Scarpitta, Lesley Ann Thomas, Weibin Wang, Alison M. Wildman, James E. Cove, Daniel T. Afflitto, Rosa J. Gonzalez, Candace L.Williams, Matthew M. Diaz, Gerard T. Nevins, Stuart T. Meltzer, Keith E. Coleman, Charles W. Garbarini, Kevin Cleary, Jason De Fazio, William J. Erwin, Douglas B. Gardner, Jimmie I. Holley, John Henwood, Marco Alberto Motroni, Joel Miller, Sean Booker, Richard Hansell Stewart, Andrea Lyn Haberman, Susan Leigh Blair, Frederick J. Ill, jr, Ann N. Nelson, Michael A. Tamuccio, Alvin Bergsohn, Jean Marie Collin have slots for photos but they are empty. Edward Joseph Mardovich has had his non-portrait imagery removed completely (as I noted in December 2014). The, at least, month long (& continuing) 'glitch' has also just happened to screw up a load of the hotlinks* from this thread so any new readers will have to search for the referenced vicsims themselves until mods can fix them. So until that imagery returns it's still 'down' in a de-facto sense IMO... at the moment it's a zombie memorial to the never living dead. Either way this whole escapade should seal the deal for anybody who's still on the fence about this whole 'thousands of victims' thing. Shouldn't the tens of thousands of family members like Thea Trinidad be asking "what has happened to our loved ones memorial"? Neither memorial has posted an apology or an explanation for this 'glitch'. * I found the Cluesforum links for Lesley Ann Thomas, James E. Cove, Daniel T. Afflitto, Keith E. Coleman, Kevin Cleary, Christopher E. Allingham, Sean Booker, Susan Leigh Blair, Michael A. Tamuccio, Jean Marie Collin & Alexander Robbins Steinman are now useless. However this is a long thread with a lot of links... there will be others. "OFFENDING PHOTOS" NOW SELECTIVELY REMOVED FROM THE VOICES MEMORIAL !!! 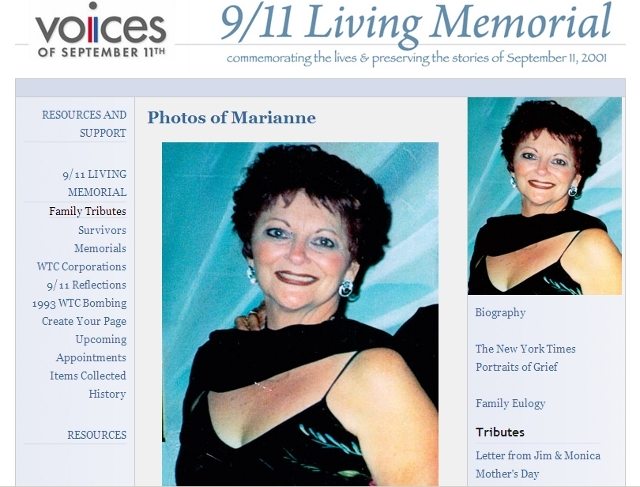 (the "9/11 victims" database is a digitally-created sham - a monstrous "photoshop photoslop album" of fictitious / phony victims. The perps have been caught with their pants down and are now 'scrambling' to do something about it). As it is, it appears that they have simply been removing - in one sweep - almost ALL the "family pictures" of the vicsims making up our list of Screamers" (i.e. the most catastrophic photoshop jobs) - and they have been doing so selectively. By selectively, I mean to say that their 'pruning' of several "victims family albums" seems to have focused on those specific vicsim pages which featured "The Screamers". Many (or most?) other 'victim' pages have been left untouched. For instance, the Brad Fetchet" page (the alleged dead son of the VOICES MEMORIAL director Mary Fetchet) still features all the 'family albums photos'. To be sure, the "Brad Fetchet" pages do not contain any "Screamers". I suppose that their current 'damage-control-strategy' of the HMPC is to try and say that the "Screamers" NEVER were posted on the Voices Memorial - and that they were fabricated / photoshopped by ourselves? Whatever ... I can only hope no one will argue, this time, that the 9/11 perps are an infallible / super-smart lot operating like a clockwork impervious to major dysfunctions and cockups. THE 45 "REALLY IMPORTANT VICTIMS OF 9/11"
So - whenever you may wonder about those alleged "2983 victims of 9/11" (the final figure 'established' by the official 9/11 Memorial) - just keep in mind that only 45 of them were...well...worthy of a Wiki entry. I've mentioned Bonnie McEneaney before in passing... she's the one who supposedly wrote 'Messages' a book about the 'spiritual messages' the '9/11 victims' left us. Now we strongly suspect none of these 'victims' died (or for the most part even existed) in the 'real world' but let's have a look anyway at some of this 'spiritual evidence' of their deaths... if just for a laugh. Particularly nauseating highlights are when Bonnie & Eamon were watching Band of Brothers on the 9th of September and he told her not to worry when he died like those 17 year olds jumping out of planes (5:05), Ruth McCourt's funeral eulogy & 'coincidentally' flying friends (6:39), Bonnie 'coincidentally' meeting Eamon's spirit bird after hearing the news of his remains being found (this news, by the way, was delivered by her Minister... just like in an old movie) (16:00) & receiving a magic, old WW2 penny from her pro-war dead husbands ghost (23:55). The brazenness of our opponents sometimes amazes even me. Anyway, back to Bonnie, what was she doing before she became some kind of 9/11 spiritualist writer? Bonnie McEneaney found the poems when she was searching with shaky hands through his belongings, preparing for his funeral. Some were snippets of guidance for his children or observations about life in New York City. Some predicted his early death. After college, Mr. McEneaney became a senior vice president at the brokerage firm Cantor Fitzgerald. But he did not want success to isolate him. He knew the homeless people near work by name and sometimes treated them to lunch, his wife said. Sometimes a wife learns things about her husband after he is gone, and this is how it has been with Eamon McEneaney's wife, Bonnie. She knew that Eamon, a senior vice president at Cantor Fitzgerald, had escaped from his office on the 105th floor after the 1993 bombing of the World Trade Center, but she did not know he had been a hero. Eamon McEneaney, 46. A star lacrosse player at Cornell University who had been painted by LeRoy Neiman; a father of four; a man, his wife says, who was very much like a leprechaun. He is not on the list of the dead, but his family has released his obituary and his wife says she has had enough conversations with other Cantor Fitzgerald wives who spoke with their husbands at the time of the attack to know what happened: there was fire, the stairs were engulfed in flames and the heat was bad. Ms. McEneaney did not get the opportunity to speak to her husband. She was on the way to her office, and he left a message with her assistant: A plane had hit the building; tell Bonnie that he loved her, that he loved the children, and that he was on his way out. By the way sometimes Eamon is stated to have saved 65 people in '93. McEneaney's teammates also are helping to raise $250,000 to fund the Eamon McEneaney Professorship of Irish Literature and Culture. The 'Eamon McEneaney Professorship of Irish Literature and Culture', whatever that is meant to be, doesn't seem to exist so I'm assuming the attempt was unsuccessful? Ahh maybe this professorship became the "Eamon McEneaney Memorial Reading Series". 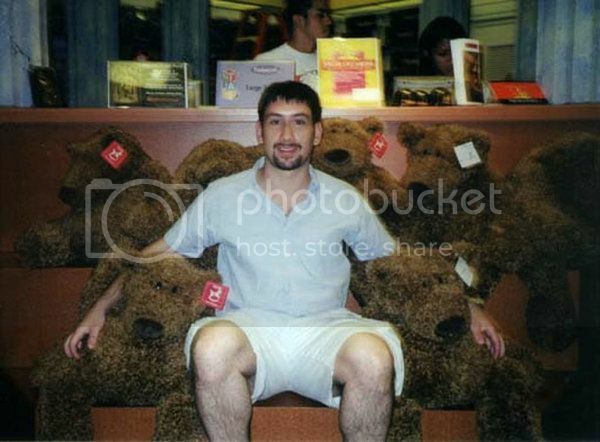 It should be noted that Eamon popped up in my earlier 'hug-me-clone' work... although, as with the screamers, his photos have since been removed from the official 9/11 memorial & replaced with placeholders. As for whether or not that Eamon became the Eamon who was 'killed by Terrorists' & came back to haunt the world as a pro-war bird or not I'm less certain. Very interesting that they deleted the vicsim family images, and that the two sites were taken down for "maintenance" simultaneously. Then both sites miraculously came back online around the same time. It must be just a bizarre coincidence ? I hope CF was able to archive all the Screamer images before deletion? I tried to search the Voices "tributes" off the Waybackmachine, it doesn't pull any data other than a small collage of vicsim images. The September 11th Victim Compensation Fund is set to expire in October, 2016. Three New York Lawmakers are pushing to reauthorize funding. The total amount of money approved for the fund is more than $1.3 billion dollars, over 5,600 awards and counting. “At that pace, the program will run out of money,” Reps. Carolyn B. Maloney (D), Jerrold Nadler (D) and Peter King (R) warned in a press release Monday. “Claim determinations could be cut by half or more, unless Congress extends and fully funds the program,” added the lawmakers, who introduced a bill a few months ago that authorizes the funding and extends it permanently. Earlier this month, Maloney said a quarter of the House had already backed the legislation. Their call for a reauthorization comes the same day as the fund released a new report outlining how many people have filed claims, are waiting on claims and have received compensation so far. They don't say when the program will run out of money, just that it will. Well, of course the money should run out at some point, shouldn't it? Or is this going to go on forever? How many decades will it take to get the vicsims paid? First responders account for 91 percent of the awards given so far, and people with cancer make up 18 percent of the awards. More than 19,000 people have submitted compensation eligibility forms to the fund, but only about 13,000 could be decided for now. Of that group, about more than 11,700 were eligible for compensation, but about half of them haven’t received it. So, we are told only half of the 11,700 or approximately 5,850 have received any compensation so far, after 14 years? Did each of those recipients receive $22,222,222? Of course not, so, where is that $1.3 billion? Is it sitting in a drawer, waiting for the bureaucracy to catch up? The lawmakers’ bill would prevent a shutdown of the compensation fund in October 2016. To be eligible for the program, a person must have evidence that the claimant was present at the World Trade Center, Pentagon or Shanksville, Pa., during or after the attacks in 2001. The person must also have evidence that the claimant died of, or suffered from, an illness or injury directly related to the attacks and have a signed authorization allowing the fund to collect information to process the claim. Oh? Gosh, I would love to see this evidence and the what the process is of collecting and analyzing it! Who's in charge of that? Obtain a list of the kinds of documents and information that we will need in order to process your claim, so that you can begin collecting any necessary materials; and Review newly updated Frequently Asked Questions. Apparently, anyone can go to their website and file for a claim. Here is the Eligibility Claim Form in PDF format, if anyone wants to read it. Where do you suppose these forms go? Is there an actual office that reviews these? Who's in charge of all of this? On January 2, 2011, President Obama signed into law the James Zadroga 9/11 Health and Compensation Act of 2010 (Zadroga Act). Title II of the Zadroga Act reactivates the September 11th Victim Compensation Fund of 2001 and requires a Special Master, appointed by the Attorney General, to provide compensation to any individual (or a personal representative of a deceased individual) who suffered physical harm or was killed as a result of the terrorist-related aircraft crashes of September 11, 2001, or the debris removal efforts that took place in the immediate aftermath of those crashes. The Attorney General appointed Sheila L. Birnbaum to serve as Special Master and administer the Fund. On June 21, 20111, the Special Master issued a Notice of Proposed Rulemaking that proposed to amend the regulations implementing the Fund to reflect the changes made by the Zadroga Act. After reviewing the extensive public comments and meeting with numerous victims, victims' families, and other roups, the Special Master is issuing this final rule and associated commentary, which make certain clarifications and changes that are designed to address issues that have been raised. Specifically, the final rule clarifies, supplements, and amends the proposed rule by, among other things: Expanding the georgaphic zone recognized as a "9/11 crash site"; providing greater consistency with the World Trade Center Health Program by adding additional forms of proof that may be used to establish eligibility; and clarifying the types of fees and charges that would come within the caps on amounts that a claimant's representative may charge in connection with a claim made to the Fund. So, it sounds like Sheila was appointed to get some more money rolling in for the fund and the "victims", since over 19,000 have applied. Sheila Birnbaum, a life-long New Yorker, has decades of experience resolving complicated litigation. She gained recognition for her work mediating a settlement of $500 million for 92 families of victims of the September 11th terrorist attack on the World Trade Center. Now, while I was researching this, I kept thinking that the name "Birnbaum" sounded familiar. I then remembered 9/11 vicsim DJ Samsson aka Joshua D Birnbaum. Not to be confused with Bond trader Josh Birnbaum - from NYC, age 37 - 'star' of a Goldman Sachs 2007 $4 billion scandal during subprime mortgage crisis. For fun, I did a little digging on these Birnbaums. I couldn't find any direct links between Sheila and either of the Josh Birnbaums (or Daniel Birnbaum, former Sodastream CEO). Also no connections to Eric Birnbaum, FBI science-minded chief, who, in turn should not be confused with the other Eric Birnbaum, a Pennsylvania personal injury Lawyer who was shot in the back of the head. or Cassi Birnbaum, former senior VP for Peak and current President of the AHIMA (American Health Information Management). Also, no direct connection to Debra Birnbaum, writer and executive editor for Variety's TV division. There's also Congresswoman, Ellen Birnbaum who was in hot water last year over some accusations that she made some racially derogatory comments. I don't think she's related to Jeffrey Birnbaum, President of BGR Public Relations firm specializing in Strategic messaging, op-ed writing, digital communications, media training, coalition and crisis management, and media relations. He is also involved in the airline, energy, financial services, tax policy, telecom, pharmaceutical sectors and worked directly for The Wall Street Journal, Time, Fortune, The Washington Post, The Washington Times, and Fox News Channel. Lots of Birnbaums in high places. Curiously, a handful of these high profile Birnbaums are based in San Diego. Sheila, based in New York, seems to be the most successful and famous of the bunch. 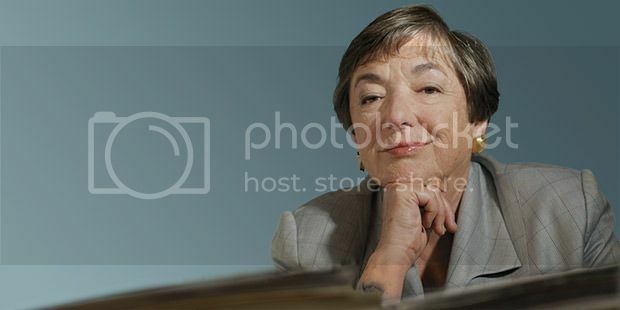 While I didn't find any curious connections, I do find it funny to think about Sheila Birnbaum's reaction when Josh Birnbaum's compensation paperwork reaches her desk. Last edited by anonjedi2 on Mon Jul 27, 2015 5:00 pm, edited 2 times in total. Last edited by brianv on Mon Jul 27, 2015 7:58 pm, edited 1 time in total. I found this story from March 19, 2015. Matthew David Yarnell, a 26-year-old employee of Fiduciary Trust Company International, has been positively identified as a victim of the Sept. 11, 2001, terrorist attack on the World Trade Center. The announcement was made on Thursday by the New York City medical examiner’s office, which said the identification was made possible by the retesting of DNA samples obtained from human remains that were recovered in 2001 and 2002. Yarnell, it is claimed, is the 1,640th victim to have been positively identified. I would like to know what this process entails. Are these human body parts catalogued and stored in a freezer somewhere? How are they able to discern which body parts belong together? How often are they retesting DNA samples from these human remains and why aren't they matched the first time around? Is any of this even plausible? 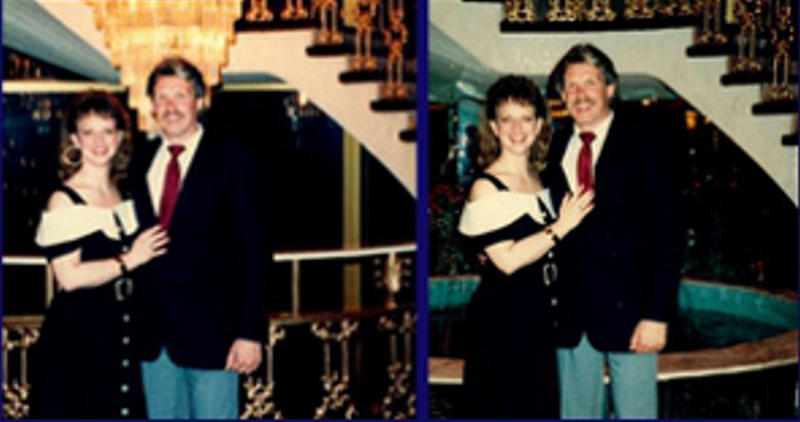 Mr. Yarnell, who lived in Jersey City, had graduated in 1997 from the Heinz College at Carnegie Mellon University. He worked on the 97th floor of the south tower as a vice president and programmer analyst in technology and was one of 97 employees of Fiduciary Trust and its parent company, Franklin Templeton Investments, who were killed when the twin towers were destroyed. Curiously, this NY Times article initially reported that Yarnell worked for Cantor Fitzgerald, instead of Franklin Templeton Investments. How do you suppose they got that detail wrong? More than once, Matthew Yarnell's mother hung up on him. He would call, disguising his voice, and try to sell her a random product -- pool supplies, anything. ''Sorry, I'm not interested,'' Michele Yarnell would say and hang up before she realized who was calling. ''He liked to have fun,'' Ms. Yarnell said wistfully. Mr. Yarnell, 26, an assistant vice president for technology at Cantor Fitzgerald, took his job seriously enough that he was promoted three times in the year and a half he was there. The article was updated with a correction. Correction: December 20, 2001, Thursday A biographical sketch on Tuesday about Matthew Yarnell, a World Trade Center victim known for his prank phone calls to his mother, misidentified his employer. It was Fiduciary Trust Company, not Cantor Fitzgerald.